When health issues or accidents occur that make it necessary for you or a loved one to look for help in order to remain safely in your home, the compassionate and professionally trained staff at Kex Rx Pharmacy & Home Care have a wide variety of home medical equipment to help out. 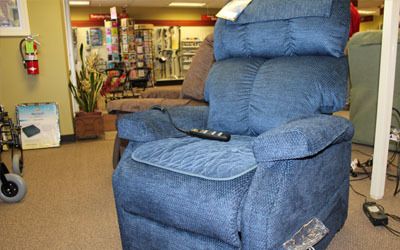 Lift Chairs – Available in a wide selection of different sizes, colors and fabrics. Respiratory Therapy – Nebulizers and supplies; Oxygen; CPAP and BiPAP. We also have Respiratory Therapists on staff available to consult with you. Please call your local Kex Rx Pharmacy & Home Care to set up an appointment. Wheel Chairs – Standard, Lightweight and Transport chairs. Rehabilitation Equipment – TENS unit; Cervical traction; Over the Door Pulleys; Weights; Pedal exercisers and Therabeads offering hot or cold therapy. 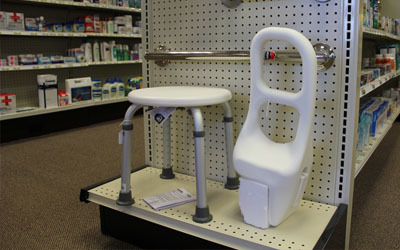 Bath Safety Aids – Commodes; Raised toilet seats; Shower chairs; Shower benches; Grab bars; Safety frames; Safety tub bars and Bath mats. Beds and Accessories – Semi-electric Hospital beds; Bed rails; Trapeze bars; Over the bed tables; Bed sheets, pads and covers and Alternating pressure pads and pumps. Orthopedic Aids – Braces for foot, ankle, knee, elbow and wrist; Rib supports; Hernia supports and cervical collars. Wound Care – Bandages; Dressings; Tapes and Ointments. Incontinent/Ostomy/Urological Supplies – Catheters; Drainage Bags; Pouches; Wafer insertion trays; Disposable briefs and underwear; Skin care washcloths and other Miscellaneous supplies. Diagnostic Aids – Blood pressure kits in both manual and digital; Blood sugar monitors; Stethoscopes; Thermometers and Scales. 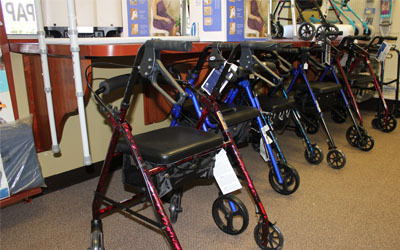 Ambulatory Aids – Canes in both straight and adjustable; Folding canes; Quad canes; crutches; Walkers and accessories and Rollators. Aids for Living – Pillows and cushions; Bathing and dressing aids; Eating and drinking aids; Reachers; Gait belts and Elbow and heel protectors. Support Stockings – Truform compression knee high and thigh high; Jobst zipper and liners; and TED (special order).